Giveaway & Christmas Copywork for the Whole Family! What are your homeschooling plans for December? Do you incorporate the holidays into your "schoolwork"? Or do you add holiday activities on top of your regular work? After years of homeschooling, I've learned that to truly enjoy the season, our family needs to keep things simple in our homeschool. Instead of adding on our Christmas books and crafts and Christmas card writing to our already busy days, we weave our days around these. A couple weeks ago, I shared my free-write prompts for the holidays. To round out our language arts study for the month, I've created Christmas Copywork. It is based on the books Merry Christmas, Amelia Bedelia and The Best Christmas Pageant Ever. We'll also be using the Brave Writer Boomerang Guide for A Christmas Carol. With these three books, everyone in our family will have festive copywork to complete throughout the month of December. The links to download 25 Fun & Festive Free-write Prompts and Christmas Copywork for the Whole Family is at the bottom of this page. If you want to know more about copywork and dictation, pop over to bravewriter.com and check out the webinar devoted to the topic. Head over to the Brave Writer store to read more about the guide for this book. A now for the giveaway! Enter to win a copy of each of the books listed above and simplify your homeschool plans for December. Click on the images below to download your free PDFs. Subscribe here for updates and more free resources for your homeschool. Need an engaging gift for your teen? Inspired by the fun of S.T.E.A.M. (Science, Technology, Engineering, Art & Math), this is a list that you and your teen will love. There's something for everyone, and something for every budget. Happy Holidays! IQ Twist: Starting with simple puzzles and advancing to complex challenges, this game will sharpen your mind and visual skills. Qwixx: A game of probability and luck, and as the name suggests, it's quick! And Fun! Sumoko: This crossword style number game has 5 ways to play and is perfect for the math-loving teen on your list. And it may just convince your not-so-math-loving list members that numbers can be fun! Patterns of the Universe: Coloring is for everyone! Especially when it involves intricate patterns. This book shows that math and beauty do go together. Fibonacci in Nature: Explore the Fibonacci spiral as it's found in nature. And allow the inner artist to create! Prismacolor Colored Pencils: Nothing beats the vibrance and smoothness of these colored pencils. Trust me. Your teen will love them. Actually, ANYONE on your list will love them! Moleskine Sketchbook: A blank book is so full of possibilities! Art sketches, engineering ideas, writing, there's wrong way to fill a moleskine! Add in some Prismacolors and your teen has the tools to share the amazing things they create in their minds! Metal Earth: These aren't your average models. Made of metal and small enough to hold in the palm of your hand, there are models for fans of Harry Potter, Star Wars, Dr. Who, musical instruments, space exploration and many, many more! Set: Can you make a set? Do it quick before another player snatches it up! Origami Kit: This mini kit is a great intro to origami. With an instruction book, paper and DVD, your teen will be creating mathematical art immediately. Math Poet: Who says you can't play with math and words at the same time? This little box of magnets just may change how you see math. Binary t-shirt: Is your teen a computer programmer with a sense of humor? Then this shirt is for them! Make: Electronics. The Make series of books offers in-depth user-friendly project instructions for a variety of topics. This one about electronics pairs well with a beginning soldering kit. Elenco Learn to Solder Kit: Many electronics' projects involve soldering and this kit is the perfect place to start. Pair it with the Make: Electronics book and your teen will gain valuable knowledge and skills with electronics. Thanks for stopping by Nurtured Roots. I hope you found something inspiring. Have a happy holiday season! Picture books are my all-time favorite teaching tool, especially when working with multiple ages. A well-written picture book is a whole pouch of seeds waiting to be planted. For your visual learner, pictures cover pages from edge to edge. For your auditory learner, a feast of well-chosen words awaits. And picture books cover a rainbow of topics and genres, so you’re sure to find something to spark the interest of your kids. Picture books are short. We want to make the most of our time during busy homeschool days, and since picture books can be read in one sitting, they’re perfect for the job. We can read the book through once, typically in 10 minutes or less, and then re-read sections we want to highlight as we guide our emerging writers to explore various techniques. Picture books are written with younger readers in mind, but that doesn't mean older readers won't learn anything from them. What it does mean is that they make ample use of literary techniques such as descriptive language, similes and metaphors, and voice. Picture book authors have a gift for serving up bite-sized portions of amazing language and vocabulary. Just enough that we feel satiated but not overwhelmed. One of my favorite books to use is Owl Moon by Jane Yolen. It’s chock-full of vivid writing and literary devices & tools with which we want our children to make friends. I’ve outlined three that are easily spotted in Owl Moon, including examples from the text. Because good writing weaves literary elements together, these overlap, but that's the beauty of this book! Here's a list of literary devices I want to make sure my kids know before they leave home. Well placed similes and metaphors blend seamlessly into the writing to compare something, possibly unfamiliar, to something familiar. To create a picture for the reader, to bring the reader into the emotion of the story. Similes and metaphors are powerful tools when used well. It’s often the difference between showing the reader what is happening, rather than just telling them. The trees stood still as giant statues. Somewhere behind us a train whistle blew, long and low, like a sad, sad song. And when their voices faded away it was as quiet as a dream. The moon made his face into a silver mask. Then the owl pumped its great wings and lifted off the branch like a shadow. I like to play a game with my kids when we’re exploring similes and metaphors. We find similes and metaphors in the text (showing) and then rephrase it so that it is no longer showing, but telling. Here are some examples from the text that "show" and my "tell" is in italics. The trees stood still as giant statues. The trees were tall. Somewhere behind us a train whistle blew, long and low, like a sad, sad song. We could hear the train whistle blowing. And when their voices faded away it was as quiet as a dream. When their voices were quiet, it was silent. The moon made his face into a silver mask. His face looked shiny in the moonlight. Then the owl pumped its great wings and lifted off the branch like a shadow. The owl flew off the branch. Then, we reverse it. I give them a simple sentence such as, “I ate ice cream.” And they rewrite it to be more descriptive by including similes and metaphors. The ice cream dribbled down my arm like raindrops plopping from the sky. I licked the ice cream round and round the cone like a merry-go-round, faster and faster until I caught every last dripping drop. I bit the bottom off my cone and it was a faucet, dripping strawberry ice cream into my open mouth. Descriptive language covers a large area of writing because really, doesn’t all good writing rely on the perfect description?! Here are just a few examples I pulled from Owl Moon. Once you read the book, you’ll see that every line, every phrase is full of beautiful description. Our feet crunched over the crisp snow and little gray footprints followed us. The shadows were the blackest things I had ever seen. They stained the white snow. Now it’s your turn. Play charades where the only answers are strong verbs. Are you galloping, shuffling, sauntering, trudging, sipping, gulping, teetering? Or pull out a magazine and leaf through it. Find a picture of a scene or something that interests you. Describe it using strong verbs and adjectives. In Owl Moon, Jane Yolen is consistently bringing us back to the setting. She gives us details right from the beginning that show us what a cold, bright, clear winter evening it is. Go on a scavenger hunt through the book to find these. Your turn. Go outside and find a comfortable place to sit. Describe the setting in such a way that your reader will feel like he is there. Keep in mind all the ways you take in your surrounding, through your senses. So, grab a copy of Owl Moon and jump in. Choose one literary device. Define it. Find it. Try your hand at it. Most of all, have fun with it. To download a printable pdf of how to use Owl Moon to explore literary devices, click on the image below. Do you feel like you’re in a race to fit everything into your day? Do you sometimes sacrifice connection with those you love as you sprint toward the elusive finish line? And do you find your ability to savor all that Autumn has to offer gets lost too? If you answered YES! YES! YES! Rest assured you’re in good company with so many other hard-working mamas. But even better, I have a solution for you. It’s my favorite remedy for fast-flying days. . . .
Poetry Tea Time has become our family’s respite in the midst of the busy seasons. Sometimes it just looks like a stack of poetry books and a plate of cookies, and it’s beautiful. At other times, when I’m feeling a little more inspired, there’s a sort of magic that settles upon our teatime and it’s beyond beautiful!! Either way, I try to remember that connection is the focus. And let’s be honest, whenever we focus on connection, there is beauty. So the next morning, the scent of apple crisp greeted six sleepy-heads as they woke. One by one, they joined me in the kitchen. They knew what was up. One plucked the poetry books from their shelf, being sure to put the seasonal ones on top. Another set the plates and cups. A third rummaged around to find the battery-operated candles we keep on hand for special occasions. (Someday, everyone will be old enough for authentic flames but for now, these work quite well.) The rest simply lingered watching birds at the feeder, checking on the monarch chrysalis at the center of the table, the little ones making a line of their treasured leaves across the table. All of us soaking in the warmth of the moment. It was one of those moments that you want to live in forever, when time actually feels soothingly slow. I was afraid my words would break the magic and so I welcomed Robert Frost to begin. One by one, poems were found like lost treasures and favorite friends. We read and ate and conversed and spilled some milk. It was magical. The leaves that had been brought home like treasures were passed around. Each person describing each leaf laid before him. (I may have casually mentioned terms like adjective and verb.) Together, we wrote these words and phrases onto the leaves, creating a poem that in its simplicity, captured Autumn. It was magical. Later on, I dipped those leaves into melted beeswax so that even as the trees outside turn to brown and the skies become covered with clouds, our leaves, our words joined together in poetry, will still look as though the sun is shining in them. Now, hanging in the kitchen, above the well-worn table that is filling with so many memories, is Autumn. Our savored morning made visible, gently calling us back to sit a while longer. Reminding us that time can slow if only we give it space to breathe. You know the saying. “Quitters never win and winners never quit.” Well, it’s wrong. Yep! Just plain wrong. Sure, there is something to be said for persevering and sweating your way to your goal. Hard work is commendable and often necessary. But what if quitting is just as admirable and essential? I think that it is. Here’s why. At the end of the summer, I did what I have done at the end of every summer for as long as we have been homeschooling. I made plans. Lots and lots of plans. And schedules and checklists and booklists. I crafted a beautifully, synchronized symphony of chores, music lessons, sports, and learning activities for six kids. It was a masterpiece. All laid out on the paper. Our “school year” began and, lo and behold, it worked. For three days. That’s it! Three days! Don’t get me wrong. I tried for weeks to maintain the smooth flow of those first glorious days when every box was checked. But the truth is. I was tired. It takes an obscene amount of energy to do it ALL. And quite frankly, I’m not cut out to do it all. So, I quit! Yep. After four weeks of trudging through four math lessons a day, four language arts lesson, history, geography, science, art, music, nursery rhymes, and salt dough making while overseeing countless other trivial details like meals and laundry, I just quit. Not the exasperated why-is-this-so-hard-quit. (Though I have done that before.) But the there-is-no-possible-way-to-do-it-all quit. What’s the difference? Not much unless you experience a shift in perspective when you throw in the towel. And for me, that’s what happened. When I fully grasped that my approach to homeschooling wasn’t working, and even more humbly admitted that my approach didn’t reflect my view of learning or values about family, then and only then could I fully quit. Knowing that in quitting I was allowing myself the biggest victory I had ever experienced. You see, in that moment, flooded with realization and crystal clear vision, I knew that continuing on in our old, familiarly uncomfortable patterns, shuffling kids through lessons without ever feeling fully connected, wasn’t working. It was actually doing more harm than good. My patience was stretched thinner than the threads of a spider web, and exasperation was my new tone of voice. So it was time. Time to quit and walk away. Waving the flag of surrender was simultaneously liberating and terrifying. Self-doubt crept in from every side. Maybe you’re just not cut out for this. Why did you think you could homeschool all these kids? What were you thinking? What? What was that? My way? I would have to fashion my own mold? Clear my own path? Find my own homeschooling voice? For once I didn’t go searching books and blogs for answers, looking for someone else’s ideals to guide me. Instead, I looked into the eyes of my children and the heart of family. What I found was an absolute, all-out love affair with books and conversation. 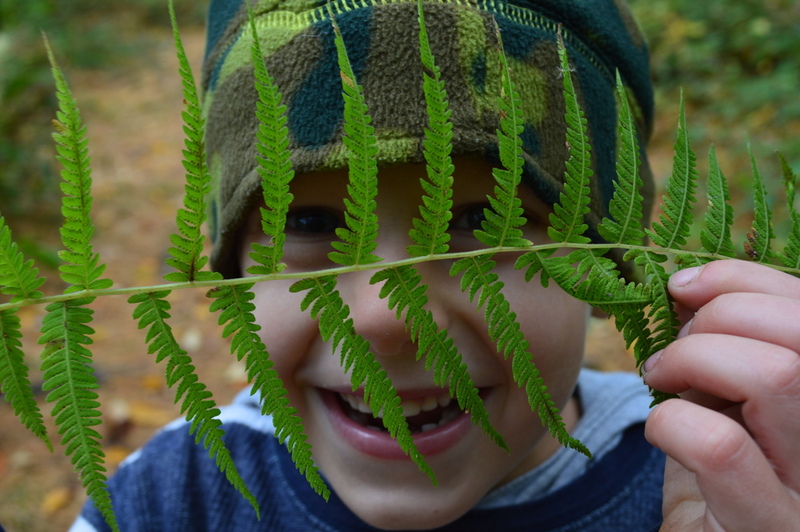 A deep trust of natural learning. And an even deeper desire for connectedness. From here, from these pillars, I have begun to re-build. Now, instead of rushing through the checklists, we linger....reading for hours, playing games, memorizing math facts, building block towers and more importantly, nurturing relationships. The days still feel full to bursting and chaos flows freely as before, but I have found something that before felt like an elusive dream. Peace. I have to laugh. I never thought that in quitting and throwing it all away, we would gain so much. Because, like most people, I believed that quitters never win. But not now. I’m proud to call myself a quitter. I quit seeking and looked within. I quit putting the opinions of others above the truth in my heart. I quit trying to meet the expectations I thought I were needed. As a family, we quit being anything other than what we are and what we may yet become. Us. The best part is that you can find the same peace, your own greatest victory, if only you have the courage to quit. Writing is like learning to ride a bike. At first, the “rider” needs our full support to steady things. After a while, all the rider needs is some gentle support as we keep our hand on the back of the seat, prepared and ready to help. Once she gains more confidence and skill, we’re able to run alongside being the encourager, but still being there to bandage the skinned knee if she falls. Once in a while there’s a wobbly day, when things just don’t go as smoothly as before, so we step in again to support our rider. But finally, the rider is independent, pedaling off while we look on, amazed at how much she has grown and changed. Never once along the way, did we say that we are riding the bike, not even when we were the ones keeping that bike and its rider upright with our own strength. The credit went to the rider, the one being brave enough to sit in the seat and try, even if only in tentative pedaling at first. It all counts. Be there for your writer. Don’t worry if sometimes you’re supporting more and sometimes less. The goal isn’t perfection on the first try, or even complete spelling and grammar accuracy. The goal is to honor your writer’s courage to share what is going on inside his mind and heart and to support him as he gains the skills necessary for strong writing. Don’t be afraid to take the pencil (with permission, of course) and transcribe what your writer is saying. The thoughts are hers but sometimes the complicated task of getting those thoughts from the brain into language to the hand and onto the paper can be downright overwhelming. Feel free to help your writer with word choice. Toss around some synonyms for ‘went’ or ‘good’. Help him choose the words that really show what he sees in his mind’s eye. You may be surprised by his perspective. Read to her (even if she is reading on her own). Talk about what you’re reading, not just about plot and characters but about the way the author used metaphor to show the sun melting into the horizon. You may learn something new together. We’re all writers . . . . because we all have something to say. It’s part of being human. We’re all at different places in our growth as writers, especially our children. Julie Bogart of Brave Writer describes the natural stages of writing in such a way that we can see the beauty of each stage. If you’re curious as to how to support the writers in your family based on where they are in their writing development, click on the image below and find out for yourself just how amazing your developing writer really is! Successfully learning (and teaching someone) to ride a bike depends on the relationship between the rider and the guider. the same holds true for writing. Too much support and the writer feels suffocated. Not enough and he feels alone and unsure. There’s no secret formula to say, give this much support here and this much there. It ebbs and flows and it is in the relationship that you will know how much is needed. So listen to your writer. Chances are she will show you exactly what he needs. My mind and heart float in a space of contented longing. It has been five days since I steered my empty suburban into the driveway and smooched faces and wrapped arms around the people I missed so much. I had been away for only four days but so much has changed. To tell the truth though, I hadn’t just been away, I had been with my tribe. I may not be able to remember everyone’s name but seeing each face was like looking into the eyes of a long-lost friend. I may not have even heard each person’s story, but there was a golden thread that united us all: a passion for creating in our families deep, enduring connections. Sitting in the beautiful retreat space, I looked around. “Remembered names or not,” I thought. “This is my tribe none-the-less." The Brave Writer ‘Be Good to You’ Retreat. This retreat was about homeschooling and writing, yes. But it was about so much more. It was about connection, collaboration, compassion, communication. It was about being real about what is hard and what is beautiful and how the lines between these blur until we find ourselves staring at the hard stuff, finding it beautiful. It was about finding my own truth and speaking it out loud. And this is where I really was when I pulled into my driveway. I was in that place of wonder, staring wide-eyed, watching the deep truths of the retreat swirl within me and around me. Wondering how they will change my family and marveling at how they were already changing me. Even the act of trying to pin words to these thoughts feels insufficient. Words too meager. Ideas bigger than life itself, it may take me a lifetime to process them all. But then again, isn’t that the point? When we’re faced with truths beyond explanation, yet so much a part of our being, we’re left in a sort of empty-full space. Our mind tries to compartmentalize to make sense of something that only our soul can fully grasp. In the days of the retreat, I found myself pondering what it means to homeschool, how home and ‘school’ need to dance with each other to a song unique to each family. How respecting the personhood of each of my children challenges me to respect my own. How trust is the core of it all: trust in the process of learning, trust in the people that make up my home, trust in myself. I found myself simultaneously overwhelmed and grounded by the glorious weight of all that I was taking in. Re-entering the rhythm of daily life has been slow and deliberate. The contended longing that I feel still lingers like the scent of lilacs in spring, strong and present, holding me in a place of awe as I allow the ideas and intentions of the retreat to seep into my roots and send out shoots of new growth. And even as I write this, I know that the growth will reach far and wide, not just for me but for everyone who attended. On the last day of the retreat, in what felt like a climactic moment, I sat surrounded by all these amazing women, listening to Julie Bogart share her heart in her talk, Invisible Education: Emotional Safety for Learning and Love. In that moment, I saw the truth. This. The power of this moment and all that it represents. This will change the world, one child, one mother, one family at a time. *This is a re-post from last year's reading challenge, but it still speaks to me today. * To have the free printables emailed to you, click here. The Big Book Pile-Up came from my desire to get our read-aloud time out of the rut it is in. Our book choices sometimes feel uninspired. Our enthusiasm waning, not because we don’t love reading aloud together, but because reading aloud with a toddler (and this toddler in particular) has its challenges. I am determined not to let this become an excuse. Reading aloud is too important for the intellectual and emotional development of our children to allow ourselves to become apathetic in our attempts. With World Read Aloud on March 4thDay coming , I decided to give our read-aloud time a kick-start, to bring it from mediocre to the joyful family time I know it can be. Together with my children, we created a list of book categories to introduce or reacquaint us (and you if you choose to join us and I really, really hope you do!) with books of all kinds. Not only will we meet great books and characters and ideas but we’ll get to know each other better through our discussions and just enjoy spending time together. The list of suggestions offers a variety of genres and topics and is meant to be a spring of inspiration. I am not sure how we will approach the list just yet. Will we start at the top? Bottom? Somewhere in the middle? Use it as more of a checklist and read a selection each day? I do know that we will try to read from a variety of sources; picture books, novels, stories from children’s literary magazines, and whatever else we can get our hands-on. We may add other genres or topics that spark our interest or skip the ones that just don’t seem to be working for us right now. The most important thing is that we’ll read together everyday!